5 daily alarms The daily alarm reminds you of events that recur every day by emitting an audible signal at a preset time. This model has 5 independent alarms to remind you in a personalized way important appointments. Strap in resin The resin is a synthetic type, an ideal material for wrist straps thanks to its extreme resistance and flexibility. Water resistance classification (10 bar) Perfect for free diving without scuba gear: the watch is water resistant up to 10 bar (ISO 22810). Neobrite The hands and/or digits have a coating fluorescent and glow in the dark after switching off a light source. 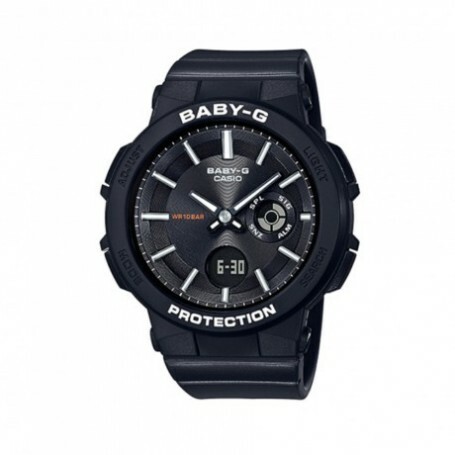 Mineral glass The mineral glass, robust and scratch-resistant, protects the watch against unsightly damage. 12/24 hour format The time can be displayed in 12 or 24 hours.